Haile Gebrselassie was born 18 April, 1973 in Asella, Arsi Province, Ethiopia. He is an Olympic and world champion. Winning two Olympic gold medals at 10,000 metres, and four world championships at the same distance. He has won major titles at all distances from 1500 metres to the marathon. 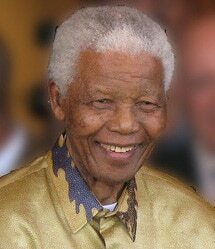 During his career, he broke 27 world records and is widely considered one of the greatest distance runners of all time. Although he is still a keen runner, he has announced plans to enter into politics to help his country, Ethiopia move forward. Haile was one of ten children growing up on a farm in Arsi Province, Ethiopia. He used to run barefoot 10km to school every day, carrying his school books. Haile said his first race was a 1,500 m school race. Although he was younger than the other competitors he started off fast and held on to win. This made him (and others) excited at his potential. He then decided to concentrate more on running. As a youngster, his big running hero was fellow Ethiopian Abebe Bikila – who won Olympic gold in 1960. His big breakthrough on the international scene came in 1992 when he won the Junior world title at 5,000m and 10,000m. The next season, in his first year in the senior ranks, Haile won his first world champion title, taking the 10,000m title in Stuttgart. Haile went on to win four consecutive world titles at this distance – 93, 95, 97 and his final world 10,000 m title in 1999 at Seville. In 1995, he continued his dominance on the track and lowered the world record for both the 5,000m and 10,000m. His first Olympic success came in 1996, Atlanta, where he won gold in the 10,000 metres. Haile later featured as himself in a film ‘Endurance’ – about the quest to win the 10,000m title. 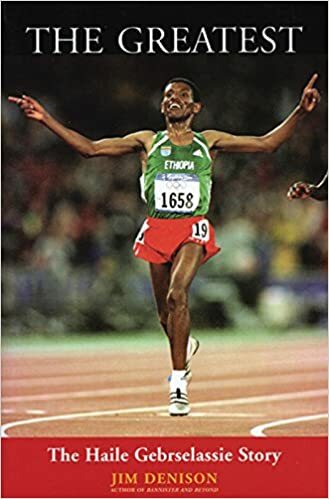 In 2000, Haile became only the third man (after Emil Zátopek and Lasse Virén)) to successfully defend his 10,000 metre title, narrowly beating the great Paul Tergat by a fraction after a blistering last 200 metres. He later said this along with his 5,000 record was one of his career highlights. 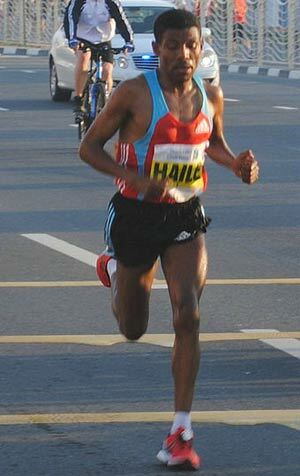 In 2001, Haile started to step up the distance and won the IAAF half marathon. He completed his first marathon in 2002 at London, where he finished third. But, Haile was still concentrating on the track and in the 2004 Athens Olympics, he attempted to become the first athlete to win three consecutive gold medals at the 10,000 metres. However, shortly before the Olympic games, he sustained an injury which prevented him from training. In the final, he came 5th, being eclipsed by compatriot – Kenenisa Bekele. After the 2004 Olympics, Haile concentrated on marathons and road races. In 2007, he won the Berlin marathon in a new world record time – 2:04:26 – a world record he would lower in the same Berlin marathon the next year (2008) to 2:03:59. In 2008, he hoped to win another Olympic medal in Beijing. However, he decided to opt out of the marathon because of fears over air quality. He finished 6th in the 10,000m. He later said he regretted not doing the marathon as the air quality was not as bad as some feared. Aged 40, Haile was still able to win races. In April 2013, just before his 40th birthday, Haile won the Vienna half marathon in a time of 1 hour one minute. Asked about he manages to retain the enthusiasm to keep training and racing into his 40th year, Haile replied. Haile has a fairly simple training philosophy. Training hard at a steady pace. He says he only does four-hour training runs once or twice a month. He likes to train in Entoto, Addis Ababa because at 3,000m altitude it is perfect for long-distance running. Sporting biographies – Famous sportsmen/women. Including football, athletics, tennis, rugby, cricket, boxing. A list of 100 sports stars, such as Muhammad Ali, Serena Williams, Pele and Usain Bolt.